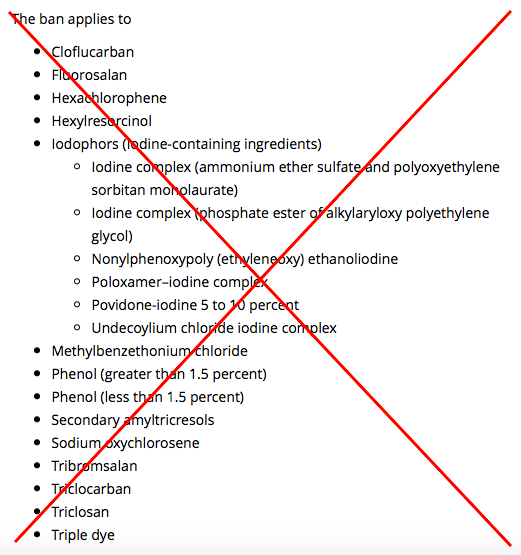 The FDA today banned the use of triclosan as an ingredient in antibacterial soaps, saying that such cleaners were no better than regular soap. 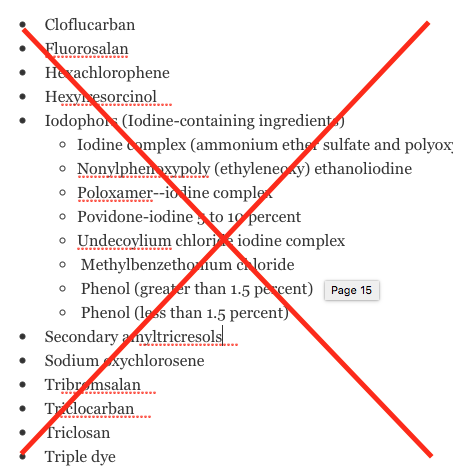 Fixed the list (had previously had too many items under the Iodine group) and fixed the image. “A lot of the marketing has been over-the-top germophobia—kill all germs everywhere, and we will all be safer seems to be the thought,” Jonathan Eisen, a University of California, Davis, evolutionary biologist who studies the ecology and evolution of microbial communities, told me. Biologist Eisen isn’t so sure. He was surprised to find triclosan in his toothpaste and blogged about it a couple of years ago.